Very Good. 178470332X ALL BOOKS SHIPPED WITHIN 1 DAY OF PURCHASE! "And how we burned in the camps later, thinking: What would things have been like if every Security operative, when he went out at night to make an arrest, had been uncertain whether he would return alive and had to say good-bye to his family? Or if, during periods of mass arrests, as for example in Leningrad, when they arrested a quarter of the entire city, people had not simply sat there in their lairs, paling with terror at every bang of the downstairs door and at every step on the staircase, but had understood they had nothing left to lose and had boldly set up in the downstairs hall an ambush of half a dozen people with axes, hammers, pokers, or whatever else was at hand?... The Organs would very quickly have suffered a shortage of officers and transport and, notwithstanding all of Stalin's thirst, the cursed machine would have ground to a halt! If...if...We didn't love freedom enough. And even more-we had no awareness of the real situation.... We purely and simply deserved everything that happened afterward." It's worth keeping that quote, that sentiment, in mind when reading Julian Barnes' The Noise of Time. 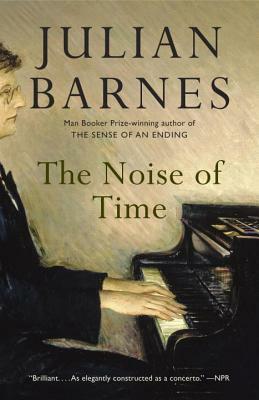 Barnes' novel about Dmitri Shostakovich opens with the composer standing by the elevator in his apartment building all night long, with a small overnight bag at his feet, smoking endless cigarettes as he waits for Stalin's security officers to come take him away. Those who were unlucky enough to drift into Stalin's vast (seven million or more dead) and frequently merely peripheral web of disfavor were invariably taken away during the night, and Shostakovich's standing by the elevator is his personal act of courage, his desperate effort to save his wife and children. I am not knowledgeable or sophisticated enough to appreciate this novel from a musical perspective, but it doesn't matter because what it really is about is courage, not the great, courageous stroke of the hero, but the small and varying courage it takes to live-to endure-for decades in fear. You cooperate here, resist a little bit there when you dare, bow low and weigh your words carefully this morning, then try to recoup a tiny fraction of self-respect by taking a small stand this afternoon. The subtle stands of resistance-a musical masterpiece like the Fifth Symphony-are offset by the capitulations that breed self-loathing and regret for the opera not written. Courage, under Stalin, had to be used by the teaspoon. Shostakovich recounts the experience of a friend, a violinist who expected to be arrested. Instead, the secret police came, night after night, and each time they arrested someone else in the violinist's apartment building, gradually working their way up, night by night, apartment by apartment, floor by floor, until at last the entire building was vacant except for the violinist. And that gradual, casual murdering of everyone else, of totally innocent people whose only crime was to have lived in the wrong building, made the violinist completely, utterly compliant. Fear is a powerful weapon, more powerful than death, because after all the dead are immune; nothing more can be done to them. Barnes has an odd writing style, a detached, cerebral style that in the only other book of his that I've read, Flaubert's Parrot, I disliked. It's as if he uses his own writing to keep all emotion at arm's length. (In Flaubert's Parrot, the narrator is so cold and emotionally detached that the result is there is no one in the novel for the reader to identify and empathize with. I found myself thinking of Herman Melville's comment in a letter to Nathaniel Hawthorne, discussing the relative value of emotion versus intellect in art: "I stand for the heart. To the dogs with the head!") Yet here, in The Noise of Time, that same distancing of emotion works, in part because the only way a man can find the courage to stand, night after night, by an elevator, waiting to be arrested, is by distancing himself from emotion. And by showing us a man who will sacrifice himself to save his wife and children, you have automatically presented someone the reader can empathize with, not a hero, not even a consistently brave man, but one who, like most of us, screws his courage to the sticking place when he can, and hates himself when he can't. Readers with more musicality than I may get more out of this book, but its universality lies in its harrowing portrayal of what it's like to live in fear, not for a day or a week or a year, but for decade after decade, and then, at the end, to look back and to think of what one might have done, might have accomplished if only one hadn't been afraid. If only. If...if. It's a lesson to be kept in mind.